WeSLAM‘s killing it with the events lately. This is the second of three preliminary slams. Ten poets. Three victors. The victors are guaranteed coveted spots in The Final Slam, in which they’ll be competing for a place on the 2013-14 Wesleyan Slam Team. If you want to watch your peers spill their hearts out or make you laugh in poems under three minutes and ten seconds, you don’t want to miss this. 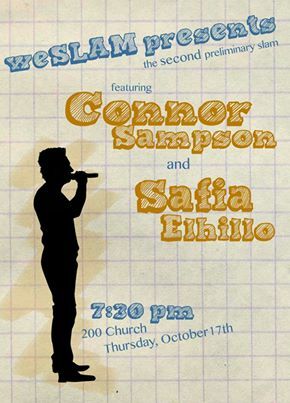 Also, the slam will feature two amazing poets – Safia Elhillo and Connor Sampson! If you’re interested in competing in the slam, want to check out some of Safia and Connor’s poems or just want to see where you’ll be this Thursday, venture beyond the jump. So you wanna slam? Lovely. Send an email to Weslam[dot]wesleyan[at]gmail[dot]com after 5PM on October 17th. First nine poets get to slam. Anyone after them will be placed in a lottery for the tenth spot. Can’t find a good video of Connor, but that don’t mean he ain’t good! Dude can perform. So, yeah, you should come. Posted by Justinian in Events, Student Groups and tagged Connor Sampson, poetry, Safia Elhillo, second prelim, slam, weslam on October 15, 2013 at 5:00 PM.